Today Falconcam viewers woke to find only three eggs in the nest box. Yesterday afternoon we noticed that one of Beauty’s four eggs appeared to have a dent or dimple in it. That most likely meant that the egg was non-viable. Then early this morning the cameras captured pictures of Beauty disposing of the egg, which had a large crack in it. All birds including falcons may occasionally lay unfertilized eggs (poultry birds do it all the time; that’s where our breakfast eggs come from). Sometimes new falcon pairs don’t always get things quite right in the reproduction and egg-laying department, so this isn’t too unusual. In 2002 Mariah laid four eggs, but only two hatched. One of those was Freedom, Archer’s father. And back in 2007 one of Mariah’s eggs just disappeared during the night. So this isn’t the first time we’ve lost eggs here in Rochester, and likely it won’t be the last. The “bad” egg was the one that was lighter in color than the others. Lighter color by itself doesn’t necessarily mean the egg is going to be non-viable though. 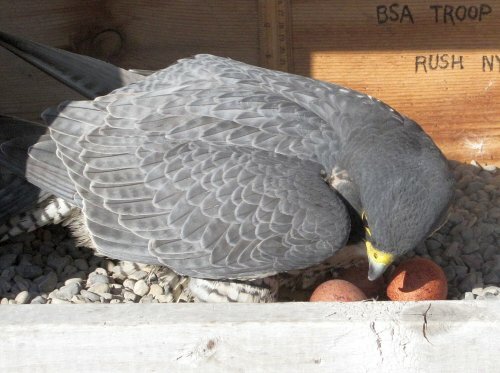 There’s a lot of variation in the color of Peregrine eggs. They range from pale pink or brown to dark brownish or even burgundy, so don’t read too much into this coincidence. We’ll probably never know exactly what caused this egg to fail. Sometimes birds lay empty eggs, but a close look at some of the pictures makes it clear that this one did have a yolk inside. We’ve discussed egg laying, along with the falcon reproductive cycle in previous Imprints articles (click the links to view the posts), but this is the first time we’ve had a really clear look at a non-viable egg. So even though it might be a little disturbing, it’s a good opportunity for us to observe the process of egg removal from the nest box. Some of you are probably wondering what became of the discarded egg. At 7:35 this morning our cameras caught Beauty moving the damaged egg around. Just one minute later, the egg was no longer in the nest box, and Beauty was gone. At 7:38 Archer came in to incubate the three remaining eggs. We’ve sent a message to our partners at the DEC to see if they can provide any other insights about the loss of this egg. We’ll bring you whatever answer we receive from them as soon as we get it. 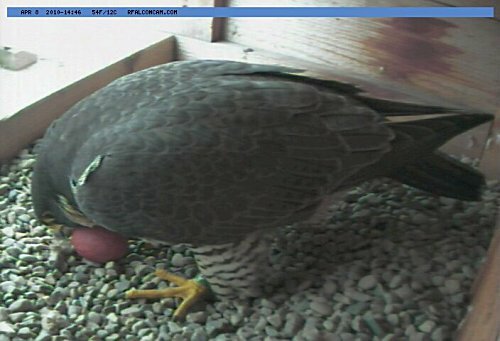 In the meantime, it looks like the falcons haven’t missed a beat, despite the cold wet snow that’s falling in Rochester right now, so we expect the brooding of the remaining eggs to continue normally. We’ll be sure to keep you up to date on all the happenings at the nest box as we await hatching in mid May. Not super unusual. May or may not have had an embryo in it. Don’t be surprised if it’s pushed out, treated like the others, or even disappears (eaten or carried off). If it’s still there at banding we’ll collect it. Perhaps it got jostled suddenly during turning or an incubation exchange, or smacked against a rough edged pebble, who knows. That’s why incubation is such a delicate period. We’ve been hoping that Quest might find herself a mate and settle into a territory somewhere, but she seems to have other plans. If the transmitter data are any guide, it looks like she’s quite content to keep on the move. On April 16th she crossed the border into New York, spending some time at the Kintigh Power plant in Somerset, about an hour west of Rochester. This coal-fired plant has a very tall smokestack that would make an excellent perch for a Peregrine. Then on the 19th we heard from our friend Doug over at the Archer Daniels Midland plant in Port Colborne, Ontario, that they spotted a falcon wearing a transmitter in their nest box. You’ll remember that this was the home of Freedom, Mariah and Kaver’s son from 2002. It’s also where Archer was hatched in 2006. Archer’s parents are no longer at the ADM plant, which is home to a new pair of Peregrines, but Doug’s note intrigued us. Could this transmitter-wearing falcon be Quest? Unfortunately the satellite data didn’t cooperate with us very much. On April 18 Quest was about 20 miles west of Port Colborne. But on the 19th we didn’t receive any data at all, and the next day She’d flown back east across the lake, ending up near Sacket’s Harbor on the US side of the international border. It’s looking more and more like she’s not ready to find a permanent territory of her own just yet. Quest is certainly living up to the best characteristics of her species. In fact, she’s spent so much of her adult life moving around that we decided to commemorate her travels with a line of Quest World Tour apparel and gear! The Quest World Tour items feature our favorite cyber-falcon with her satellite transmitter on the front. On the back you’ll find a list of all the places she’s visited over the past couple of years. And for those who don’t like back-printed clothing, we’ve got Quest Satellite gear that just includes the front image. So if you’re like us, and you can’t remember where Quest has traveled, just click on over to the Rochester Falconcam store at Zazzle and pick up a shirt, tote bag or mug! You’ll get a great keepsake and you’ll be helping to keep the Rochester Falconcam operating. 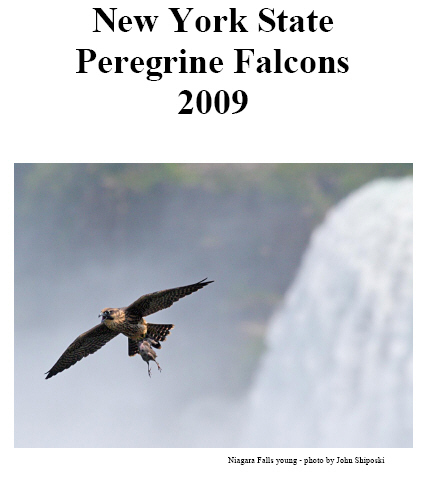 2009 was another banner year for Peregrine falcons in New York State. Barb Loucks of the DEC sent us their latest report, which is full of good news for the falcon population. There’s a detailed account of last year’s activity here in Rochester, including Mariah’s troubles and the arrival of Beauty and Archer. They also included a nice write-up regarding Quest’s travels. 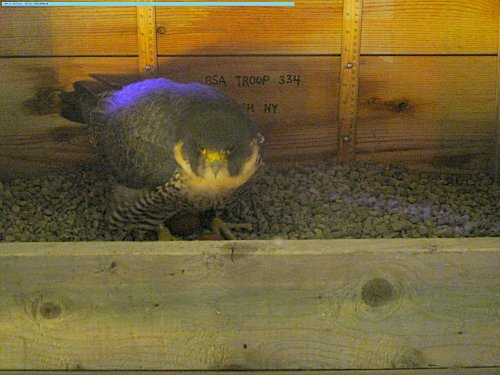 Everyone at the Rochester Falconcam is pleased to be a part of the Peregrine recovery in New York. With the help of volunteer watchers and our many fans who monitor the nest box cameras, we’re able to provide valuable information to Barb and her colleagues. If you’re reading this, you can take pride in the contributions of the Rochester Falconcam community. Yep, you guessed it, Beauty laid her fourth egg. We got our first clear look at it at 6:43PM. 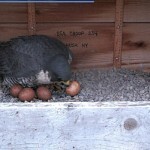 She and Archer have been sitting on the eggs pretty much constantly since the third egg was laid on Monday afternoon. 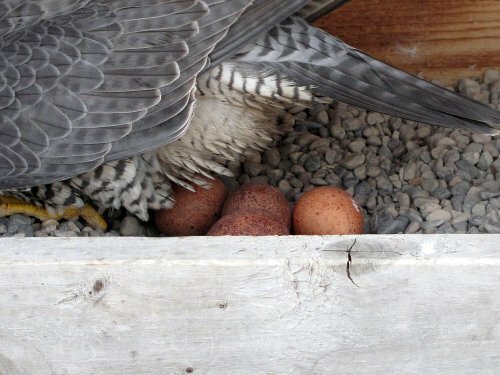 Four eggs is an average clutch size for peregrines, and they usually begin incubating the eggs when the next to last one has been laid, so we’re fairly certain that she’s going to stop at four. So, when will the eggs hatch? Well, provided that this is, in fact her last one, if we look back to Tuesday the 13th as the start of “hard” incubation, it ought to be 33-35 days from then. In other words, look for hatching to begin sometime around May 16-18. It usually takes a day or two for all of the eggs to hatch, but we should have some new eyases to watch by the third week of May! Quest continued her restless movements over the past week, covering several hundred miles. She went as far east as Portland, Maine, and as far west as Toronto. She’s covered two Canadian provinces (Ontario & Quebec) and two states (Maine and Vermont) in the US. That’s quite a road trip for our plucky Peregrine. There’s no indication that she’s about to settle down, though she has returned to the Lennox power station a few times during April. It could be that she’s on the hunt for a mate, or maybe she’s just infected with a bad case of wanderlust. Trying to understand all of her behavior based only on where she’s going (or where she’s been, depending on how you look at it), is a bit of a murky task. Still, this glimpse into her life is welcome, however limited it might be. We get to celebrate our 400th post here at Imprints with the fantastic news that Beauty has laid egg nuimber three! It looks like the egg was delivered right around 8:45AM, but we had to wait another fifteen minutes to get a decent look at all three of the eggs. There are two on either side of her bill (the new one is on the right) and one behind her bill. Beauty’s taking a well-deserved nap right now, covering the eggs. It’s too early to say if incubation has begun, but we’ll keep our eyes on the nest box to see if she begins to brood. If so, then we’d expect one more egg for a final clutch of four. Check back often with the Rochester Falconcam to see what happens next with Beauty and Archer! Proving she’s no one-hit wonder, Beauty laid her second egg last evening, somewhere around 11PM. Both eggs are visible in the picture above, though it can be hard to see them. You can see one just over the lip of the nest box. The other is a little farther back, but they’re both between Beauty’s feet. We’ll get a better look when the sun rises. Falcons try to brood, or incubate their eggs all together, so that they hatch around the same time. 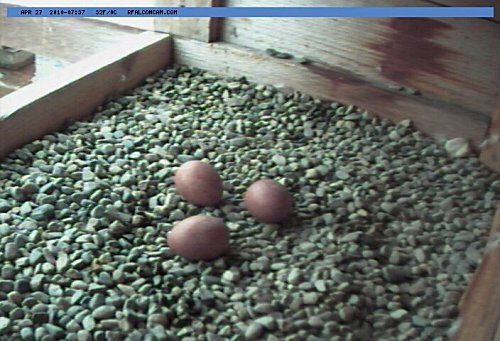 Usually they’ll begin brooding the eggs when the next to last egg is laid, so watch her closely. If it looks like she’s beginning to incubate, we’ll know there’s probably one more egg to come. Speaking of incubation, one of the questions that gets asked most often has to do with the fact that falcons may leave the eggs uncovered for long periods of time. This may seem unusual, but as long as the eggs don’t get below freezing, they can survive for several days without incubation. When incubation does begin, both Beauty and Archer will both participate. They’ll place special areas of their breasts called brood patches in contact with the eggs. The brood patches have lots of blood vessels close to the skin’s surface, and these transfer the falcon’s body heat to the eggs to sustain the incubation process. Female falcons have larger brood patches than the males do, so they’re better suited to brooding larger clutches of eggs. 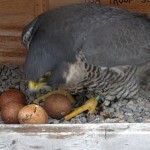 But the males are pretty good at it too, so you’ll probably see Archer taking his turn keeping the eggs warm. Beauty Comes Through With First Egg of 2010! We’re beside ourselves with glee that Beauty has laid her first ever egg! The pink ovoid appeared just before 2:40PM this afternoon. This is great news after all the ups and downs that we endured in 2009. With this egg and the others that should follow, we’re hopeful that the rich legacy begun by Mariah in 1998 will continue for 2010 and well into the future! How many eggs will Beauty lay? It’s impossible to say right now. Average clutch sizes are around 3-4 eggs, but since Archer and Beauty are a new pair, she could lay fewer than that. Plus, not all of them may end up being viable. Mariah laid four eggs in her first year with Kaver, but two failed to hatch. Of the two that did, one was Freedom, Archer’s father. What a wonderful string of events that has brought us to this point! Now that egg laying has commenced, keep a close eye on the Rochester Falconcam to catch all the latest action. Quest spent the last days of March near Prince Edward County, but in April she took a different path. First she went north, then she turned south-east. Her movements over the past few days have been in nearly a straight line. She’s been covering a lot of ground and it looks like she could be headed for the coast of Maine. Quest got to enjoy the unseasonably warm weather that affected the northeast portions of North America over the weekend. Her transmitter’s temperature sensor recorded a reading as high as 31°C on the 3rd of April. So she’s definitely moving around a lot. It’s likely that means she hasn’t attracted a mate, though of course we can’t say that for sure. We’ll just have to keep watching to see where she ends up. You are currently browsing the Imprints blog archives for April, 2010.